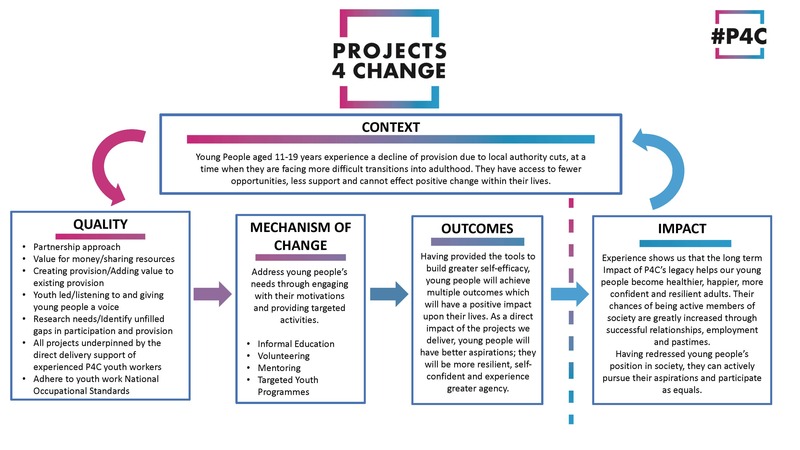 Our theory of change diagram sets out the process we use to develop projects with young people. It is a tried and tested model which is underpinned by quality standards. Young people will have a say in directing the work of Projects4change, through their involvement they will have access to opportunities which bring about multiple and lasting change within their lives. The impact of our project will be specific to the type of project delivered but will include, better aspirations, more self-reliance, self-confidence and agency. Young people will become more skilled communicators, more self-aware, reflective and socially motivated. They will establish more positive relationships with adults, peers and their community. They will develop their personal values and have greater respect for others and be more tolerant of difference. They may develop useful life skills and the opportunity to enter volunteering, work or education, therefore having more opportunities to succeed in life. They will gain support to pursue their creativity and to become more enterprising and open to new ideas. Young people will effect change in their communities and support others. They will be physically and mentally healthier, happier and feel more included into society. Our strength lies in mentoring workers, we will teach the process of creating projects in a way which is easily accessible for organisations. Where workers have no time to access training, we train as we go. Instead of delivering projects on the behalf of organisations, we recognise that this would not impart the knowledge needed to work towards independence and sustainability. Our way invests in the future of those projects and helps them to be more sustainable. We are strengthening projects and enabling them to put young people’s needs at the heart of their development. We offer all projects the chance to conduct a peer led consultation, conducted by our Change Maker Volunteers 14-19 years. By listening and responding to their young people ideas we are helping projects to be youth led and further embedded within the communities in which they serve. To learn more of about the value of theory of change visit The Centre For Youth Impact.